More and more we are finding that brides are taking the unconventional approach to their wedding design. Joining forces with the amazing floral designer Nancy Liu Chin, we sought to create a wedding look to inspire those looking to make a statement in a beautiful way. We were so lucky to collaborate on this look with so many wonderful vendors, and we can’t wait to share with you these lovely images from the talented, Kevin Chin. The color palette focused around blacks, shades of yellow, and a few touches of dusty blue and muted greens. With the table design we layered textures from La Tavola Linens – a floral eyelet design on top of muted yellow with a velvet napkin. Dark containers, candlesticks and rounded back chairs bring a depth to the overall look. Bringing the look together are mustard colored goblets, abundant florals and fresh fruit for a unique pop. The trio of centerpieces offers variations in height which adds an organic flow along with the open nature of the arrangements. Mustard colored goblets from Hensley Event Resources tied in the florals with place settings and velvet napkins. A simple, sleek flatware design remains understated while the feminine place settings brought just the right amount of detail to each place setting. Florals of ranunculus, peonies, and roses offer a romantic look. We added cut pears, grapefruit and lemons to tie the look together and bring a little color to the tabletop. 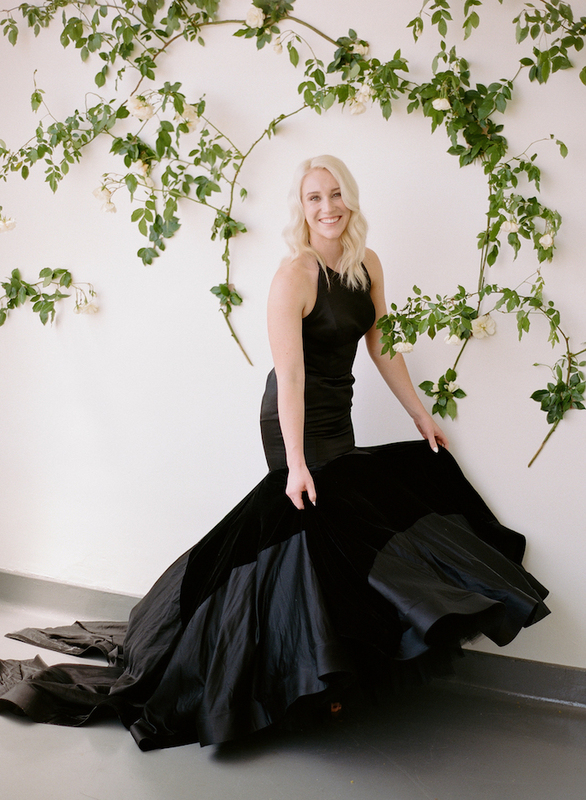 An uncommon twist – yes, a black dress! This black gown from Kinsley James Couture Bridal added the right contrast with the yellow and green floral palette. This formal cut dress by designer Tara LaTour, makes this moody look so fitting. Behind our lovely model, Jole, a wall installation of creeping vine foliage – a simple way to make a plain wall interesting! The well-known work of Maria Chang of PMA brought her beauty with natural hair and makeup to tie the look together. 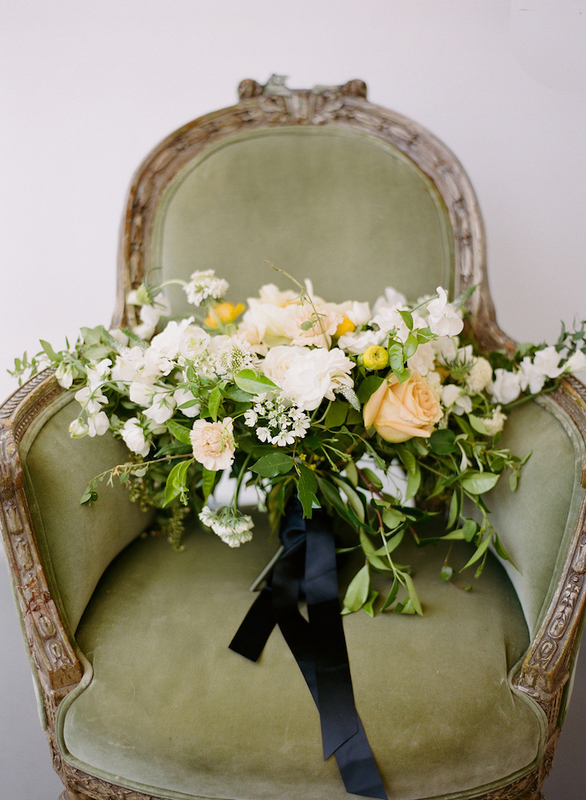 This gorgeous vintage chair from Found Vintage Rentals displays this lush floral bouquet and black detailed shoes from Bella Belle. The invitation suite brings the entire look together with gorgeous calligraphy from Lamplight Lettering and overall design by Elsa Madeline. With a lovely velvet box to display the engagement ring in from The Mrs Box, all of the details make this so special! A simple cake design from A Spoonful of Sugar Cakes was perfection. 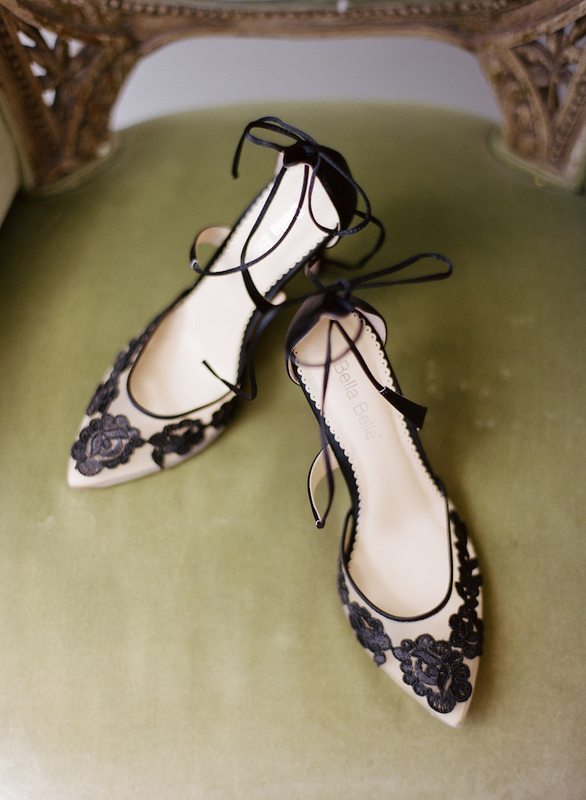 We love the sugar floral additions to tie in with the rest of the wedding style. The cake table is styled with fresh cut fruit and taper candles to mirror the dining table. When creating a look for your wedding day, it’s important to remember the design doesn’t stop with visuals. When it comes to catering and entertaining your guests, the food can be quite the show stopper! The day following our shoot we partnered with Betty Zlatchin Catering to host a luncheon for local wedding vendors and we have to say, we were amazing with the deliciousness this catering staff brings! We love partnering together with other amazing businesses we admire! And, we love to collaborate! Be sure to check out the talented team below and click HERE to inquire about your next event. We can’t wait to work with you!